Eclectic Paperie: eP Turns 1....& the Fun has Begun! Can you believe that it was just a year ago that eclectic Paperie went "live" for your shopping pleasure? WOW! what a year it has been and we can't thank you enough for exceeding all of our expectations with your continued support. Your input in the eP product mix has been extremely valuable. Your referrals have been blessing. The friendships we have made on this incredible journey....priceless. We have several announcements and promotions over the next several days so make sure the you are signed up our newsletter so you can be the first to hear about them. 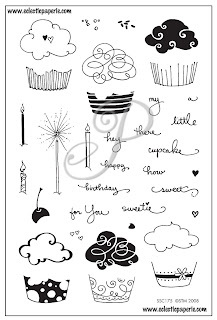 We are happy to announce that eclectic Paperie is debuting a brand new Stampendous acrylic stamp set called: Hey There Cupcake. It is "oh-so-cute" with all the cupcake designs and greetings. This samp set will only be made available at eclectic Paperie until May 2008. It is an eP exclusive. I had a chance to play with it and here is my first sample using this fun set. I actually needed a simple card(quickly) for my neighbor so I pulled out my Cuttlebug and used the Spots and Dots A2 embossing folder for some added texture to Regal Rose(SU) cardstock. I found a piece of Chocolate Chip and applied some Brillance Pearlescent Orchid directly to it. Love the added shimmer with that ink. 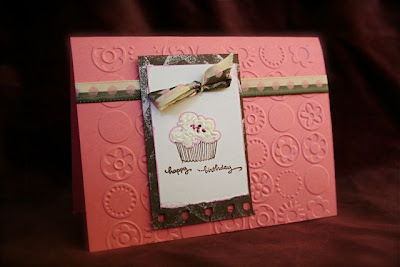 I also used that ink for the cupcake top and Jumbo Java Versamagic Dew Drop for the cupcake liner and sentiment. I really like how these inks are rich in color. I used Liquid Appliqué for the icing and it really looks like icing when it dries. If you emboss liquid Appliqué, it even takes on more dimension. I had to add some SPARKle so I reached for the Pink Stickles. Stay tuned Friday and Saturday as a couple of our eclectic Friends, Taylor VanBruggen and Jami Sibley, are going to help us with some birthday fun. 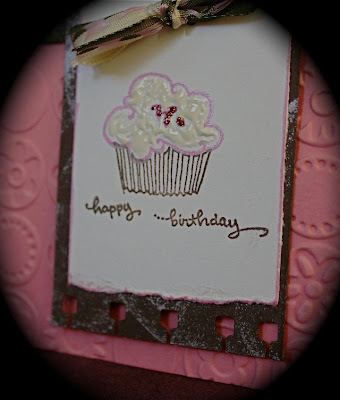 They will challenge you to some stampin fun over at our eclectic Paperie Forum. Don't forget to look at the Brand Spankin' New section. There are a boatload of new stamps, new Disney-themed Cuttlebug folders and dies. a small sidebar: If you or know anyone who are big Mac fans, check out MacSparky for some details and photos of all the new and exciting things going on right now at the annual MacWorld event in San Fransisco. You have to see THIS latest in iPod accessories(scroll down) for you home.